At least nine very ripe (the insides should be like goo) persimmons. Several dozen dates (The wetter the better). 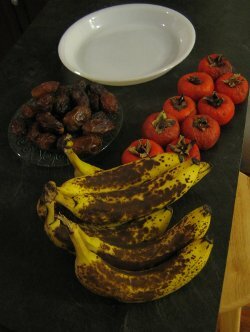 Six to eight very ripe bananas (the outside should be heavily speckled with brown and no green should be visible). Several dozen blueberries or blackberries (optional). Step One: Cut the dates in half with a knife and remove the pits. 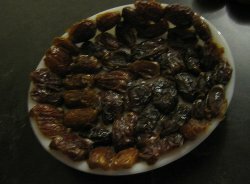 Press the halved dates into the pie plate. Step Two: Peel the bananas and place them on top of the dates in the pie plate. Step Three: Mash the bananas with a fork until they're at the consistency of custard. 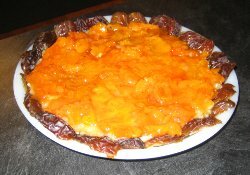 Step Four: Remove the skins from the persimmons and spread the Jello-like interior on top of the mashed bananas. 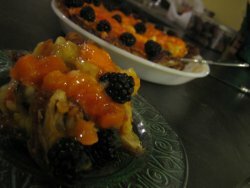 If the persimmons are not like Jello, they're not ripe enough. Step Five (Optional): Place the blackberries or blueberries on top. I personally think blueberries taste better on it. The recipe doesn't really need either, but it adds a bit of pizazz. 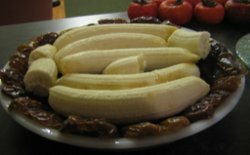 You can also slice up a banana and place those slices around the pie, as seen in the first picture on this page. 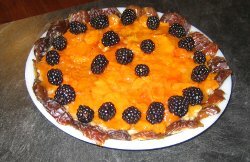 Read how this persimmon pie fits into a healthy raw food diet. Find other low fat raw recipes here.